Super Grand Slam for Fat Girl. Home | Browse | South Africa | KwaZulu-Natal | Durban | Super Grand Slam for Fat Girl. 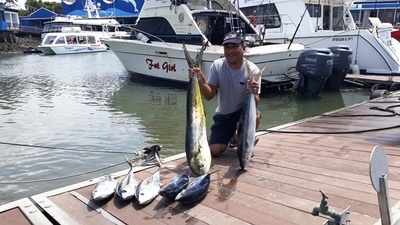 So in 2 days for fishing it was like fishing 2 completely different oceans, Thursday saw a stiff SW wind and although the sea was not so bad the current was screaming S-N making all kinds of fishing really difficult we managed 1 x Yellowfin Tuna. The Friday came with a light SW wind and the current had slowed down, warm blue water had also come in and there was a very distinct colour line. The first line went early and resulted in a Wahoo bite off before we got it to the boat, this was just the beginning and we had a lot of activity and even with some fish not committing and coming off we ended up with a really fun day and 4 species of Game fish making it a Super Grand Slam. The final account was 1 x Dorado, 3 x Yellowfin Tuna, 2 x Oceanic Bonito and a good size Rainbow Runner. I was a bit frustrated at the Wahoo bite off as this has happened a few times now, but good to see them around. 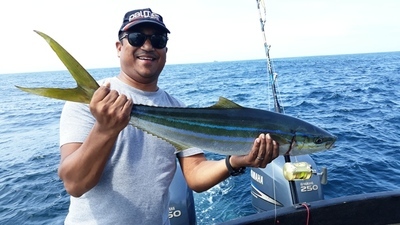 Getting that Rainbow Runner was awesome as it is not a common catch off Durban.